This section has information about protective gear other than helmets. For helmet information go to Gear: Motorcycle Helmets. For the research on full protective outer gear and helmets go to Research. 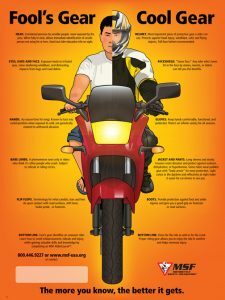 Personal Protective Gear for the Motorcyclist: The Motorcycle Safety Foundation (MSF), as part of its Cycle Safety Information series, produced this four-page document describing all aspects of head-to-toe riding gear and protective apparel in varying weather conditions. Fool’s Gear vs. Cool Gear Poster: A pdf version of the image. Comparing Motorcycle Riding Gear: A textiles-versus-leathers analysis by Robyn Smith, originally posted on the UK-based site formerly known as “Best Motorcycle Information”. Protective Equipment for Riders: This 16-page booklet produced by the European Safer Urban Motorcycling (eSUM) Project offers clear guidelines on how to choose personal protective equipment and shows the evidence-based benefits of wearing jackets, trousers, footwear, gloves, and head and face protection. Gear Up for Every Ride: An alliance that has come together to act as a force for change in the motorcycling community. The campaign is sponsored by the Motorcycle Industry Council. The goal of the campaign is to inspire a fundamental shift in the way riders think about their gear and to make educated decisions about the gear they wear when they ride. Rock the Gear: Up-to-date information on all the latest technologies in protective apparel, with links to new articles from industrywide sources, and passionate support for wearing all the gear all the time. Cycle Sports Radio host Patrick Harris discusses motorcycle-specific gear with Brittany Morrow, CEO and founder of Rock the Gear, who knows firsthand the devastating consequences of not wearing proper gear and crashing; view this hour-long video where the two discuss head-to-toe (helmet-to-boots) gear options, the myths about gear, and the reality of what it does to help save your life.